Specialized in Hair Extensions, Traditional & Vivid Hair Colors & Hair Style Cuts. Hillary Small is one of Asheville's favorite hair stylist. Located in Downtown Asheville NC. One of a kind talent, beautiful Asheville hair salon, designed for you. Great Lengths Hair Extensions - Professional Permanent Hair Color, Vivid & Traditional Colors - Hair Cuts and Razor Cuts - Special Events - Facial Waxing - and more. Over a decade of experience showcasing people's beauty, building their confidence and earning loyal clientele through the art of hair. A hair stylist who listens, a stylist you can trust. Your stylist for life. Hillary is one of Asheville's favorite hair stylists. She loves the art of hair, and she also brings the artist out in you. She listens and together you discover exactly what you envision and she brings it all to life, better then imagined. You will not find many stylists skilled in cuts, razor cuts, vivid/traditional colors, and Great Lengths Hair Extension certified. What ever challenges you present, rest at ease, she will highlight your beauty and deliver amazing breathtaking results. Lavender and Lace is one of Asheville's favorite Hair Salons. It has a cozy and elegant feel offering a comfortable setting to relax and enjoy yourself. 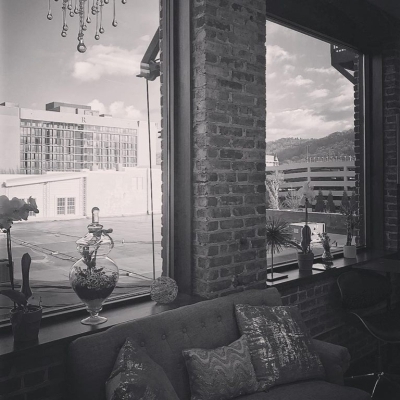 The salon is located in the heart of downtown Asheville at 124 College Street. Enjoy learning more about this Salon and why it is perfect for you. From the artist, style, equipment and location this salon is one of Asheville's favorite best kept secrets. Looking for the best quality hair extensions on the market? Do you have that color you feel no one can nail? Do you just want a stylist who actually listens and you can feel comfortable to work with your hair? Check out the services and see how Hillary is exactly who you have been looking for. Photos speak louder than words. Get lost in all the many styles Hillary has done. A show case of hair extensions. Also a huge variety of highlights, hair color, balyage, sombres, ombres, and much much more. The portfolio is updated frequently so check back in for more ideas and see new happy clients. For booking an appointment or setting up a consultation, please call 828.582.1620 or click the link below to book online.